Blind Corner Pull Out – Slide Out Shelves LLC. Restore Full Functionality of Hard-To-Reach Spaces in Your Kitchen! 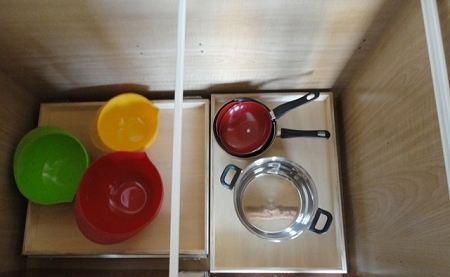 Many kitchens have certain cabinets that are built in the corners and have spaces that are hard to access. These are commonly referred to as the dead corner or blind corners—aptly named, because once something goes in there it can be a nightmare trying to get it out. 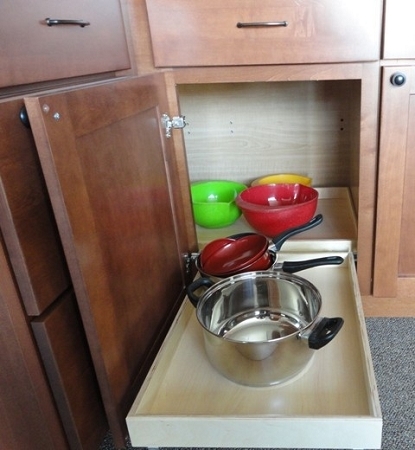 With the latest innovations from Slide Out Shelves LLC you can optimize the storage of your corner cabinets by installing blind corner pull-out shelves. Being a non-handed shelving unit blind corner pull-outs can be installed on left or right hinged cabinets. The pull-out function brings out two independent rollout shelves giving you convenient access to the back of the cabinet. It also features a heavy gauge wire construction for elegance and extra durability. 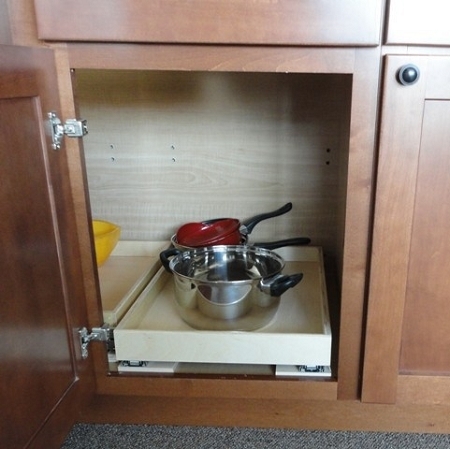 Blind corners in kitchen cabinets always present a storage problem, our pull out Corner Connection™ unit will remedy that. *The shelf that sits into the blind corner part of the cabinet requires a 15" opening to fit inside, this is why we offer this product starting at 15" wide. Blind corner shelf was fantastically easy to install and makes virtually full use of my available blind corner cabinet space. I would recommend it to anyone. The quality was excellent and the price was great. We absolutely love your product; it is nicely made, easy to install, and fits perfectly!! Thank you. Just want to say thank you for the great shelves. They were fairly easy to install and work beautifully. It's a terrific product.